Washington, DC – With health care now 18 percent of the Gross National Product and climbing each year, Robert Pearl, M.D., keynote speaker for the American Medical Group Association 2016 Institute for Quality Leadership (IQL) conference, underscored the innovative and disruptive thinking needed among physician leaders to transform health care delivery and achieve the Triple Aim. 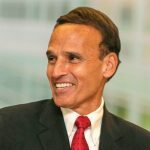 “Economics, not politics, is ultimately the most powerful driving force in health care today,” noted Pearl, who is chairman of the Council of Accountable Physician Practices (CAPP), a coalition of high-performing multi-specialty medical groups and health systems, as well as CEO of The Permanente Medical Group and president and CEO of the Mid-Atlantic Permanente Medical Group. “If we change the structure, modify how care is reimbursed, and embrace 21st century technology, we can improve quality and access, while at the same time lowering the cost of healthcare delivery overall. “For example, through capitated payments, financial incentives will reward keeping people healthy, encourage prevention, maximize patient safety, and lead physicians to diagnose sooner and treat more effectively,” he said. During his presentation, Dr. Pearl noted that attempts to change the health care cost equation in the past focused on reducing access to care, rationing medical care or reducing provider payment. None have proven effective, and all decrease quality and patient satisfaction. He supports the movement towards payment based on value, rather than volume, and recommends that the nation stay the course. As part of the shift, he outlined various opportunities for clinical and operational improvements. Examples included approaches to reduce the time between surgeries and ways to minimize hospital care delays over weekend days. Dr. Pearl cited the success of the various CAPP medical groups in implementing digital communications and electronic connectivity as the types of innovations that have lowered operating costs across multiple sectors when implemented through large, physician-led multi-specialty medical groups. Similar innovative applications need to be widespread in health care in order to flatten the trajectory of health care inflation across the entire nation. Video and digital photography that enable physicians to diagnose patients remotely and secure appropriate care immediately. One example of this technology in action is the use of video consultation with a neurologist to quickly evaluate a patient in the emergency department who might be having a stroke. This practice has already reduced the time for a patient to receive appropriate treatment by 50 percent. Data analytics that can identify groups of patients and individuals who are at risk for specific conditions, or who require additional care. Use of the electronic medical record not just as a repository of data, but as a communication tool between healthcare providers. This technology enables the best patient care decisions to be made at every point in the care continuum. “When payment is tied to patient outcomes, and the re-engineering of healthcare delivery is led by physicians, we will see a reduction in the inefficient fragmentation that is so costly today, and improvement in the quality of care that patients receive,” concluded Dr. Pearl. For information on patients’ experience of coordinated care and the use of technology with their doctors, see results from two Nielsen Strategic Health Perspective Surveys from 2015 and 2016, sponsored by CAPP. Browse the pages of this site for more information on accountable care. To learn more about physician leadership in the work to achieve accountable care, and to receive updates on key health care issues, follow CAPP on Twitter at: @accountableDOCS.